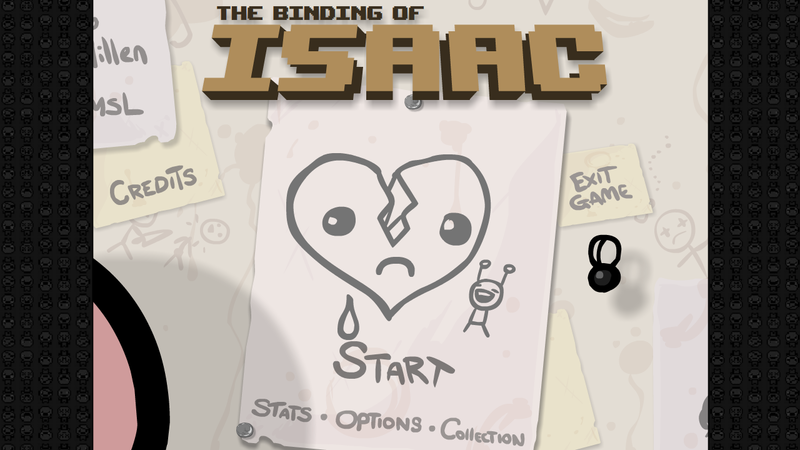 The main menu of The Binding of Isaac conjures up exactly what the gameplay entails: a poor boy running away from frightening things. Like most of my steam collection, I’ve owned The Binding of Isaac (which will henceforth be shortened to Isaac to save my sanity) for a while now, but have never actually gotten around to playing it properly. That was the whole point of my one game a week idea, but in this time I’ve collected more and it’s becoming a impossible task to finish my game collection. I’d played Isaac before, for about an hour, and just couldn’t understand why people found it so addictive and enjoyable. That’s how it’s been left for years, until these last few weeks that is, I’ve been hooked, playing dozens of hours of the game to try and beat the game over and over again. The game starts out with a little intro to let you know the plot of Isaac before giving you the main menu. The general gist of the story is that Isaacs mum is a religious nut, which starts hearing voices telling her to stop Isaac from doing things. Eventually, this voice escalates and tells Isaacs mum that she must sacrifice Isaac in order to show her love and dedication to God. With Isaacs mum at Isaacs door, Isaac manages to escape through a hidden door in his room which leads to a underground basement full of monsters that he must fight off. In the main menu you get to see your collection of all the items you’ve collected so far, and eventually you get to pick your character (which is just Isaac at the start) and then you set on your way. Items are randomly dropped throughout the levels, with each one being unique and giving Isaac a different ability, you could literally spend hundreds of hours trying to collect them all. This is all the information you’ll need to survive through the treacherous basement. It may seem simple, but it’s difficult to master. 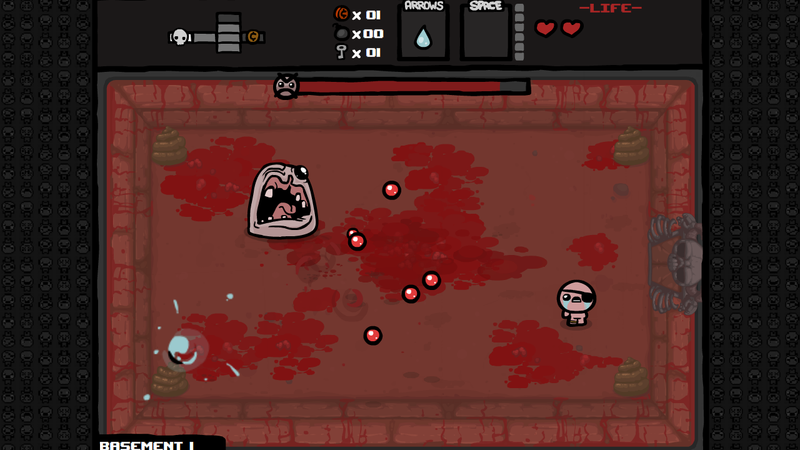 Isaac kills enemies with his tears that are thrown as projectiles. You control Isaac’s movement through the WASD keys, and control the direction he shoots either by mouse, or by the arrow keys. Its a simple system that’s hard to master, especially when your tears have physics that change direction depending on how your character is moving. You collect items as you sprawl the dungeons, each one being a mystery until you pick it up or use it. 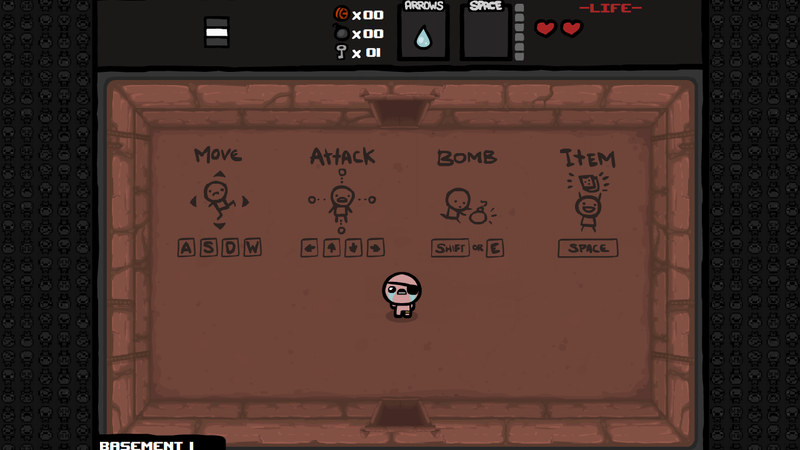 Some items affect Isaac himself, increasing his combat strength or amount of tears he fires, or others may be objects that protect Isaac like a fly that circles him, attacking enemies that get near enough. With more playthroughs of the game under your belt, you’ll start to recognise what each item does, and eventually, you’ll start hoping and wishing for some to appear after defeating a boss as you know they’re good items to have. The whole game is randomly generated, meaning rooms, items, bosses and secret rooms are never a certainty. You may start a game and die within a few minutes due to one room after another having the hardest enemies, or sometimes you’ll make it to the end no problem. The Randomness of the game is what keeps you coming back for more; It’s like a gambler, who needs to just try one more time as this time may be the one. Isaac may seem hard at first, but keep on playing and you’ll begin to master it’s intricacies, you’ll be able to take on the random enemy generation in each room, no matter what items you have on you. It’s the randomness that makes this game in the end, and it’s the randomness that keeps me coming back for more. Bosses come in many different shapes and sizes. This one above (Monstro) is one of the easiest, occasionally jumping around and spitting blood at you. Keep your distance and you’ll be fine. The art style is fantastic, coming from Edmund McMillen of Super Meat Boy Fame, it really is unique but at the same time familiar if you’ve ever played any of his previous games. The game can be quite dark and twisted, but in a humourus way. There are times where you’ll have to take on demon fetus’, or pick up your dead dogs head as an item, it’s all lovingly drawn, but sinister at the same time. Each map/level is random, so you’re never sure which way will be correct until you’ve explored til your hearts content. It can be difficult negotiating which way to go when you’re low on health and need to find your way to a treasure room, but that’s part of the fun. At the end of each map is a boss room, where you must defeat one of the many bosses in order to progress deeper into the basement. Defeating a boss gives a random item, to help in your adventure to survive as long as possible. This progression continues until you finally reach the depths, where you’ll have to take on your mum, defeating her and winning Isaacs freedom. Once this is over, the game has a lot of replayability, with the true ending reserved for after you defeat mum once, which grants two extra stages at the end that take place inside mum’s womb. Whenever you die(which will happen many a time), you’re presented with the following screen, which shows all of the items you collected throughout the game and what ended up killing you. 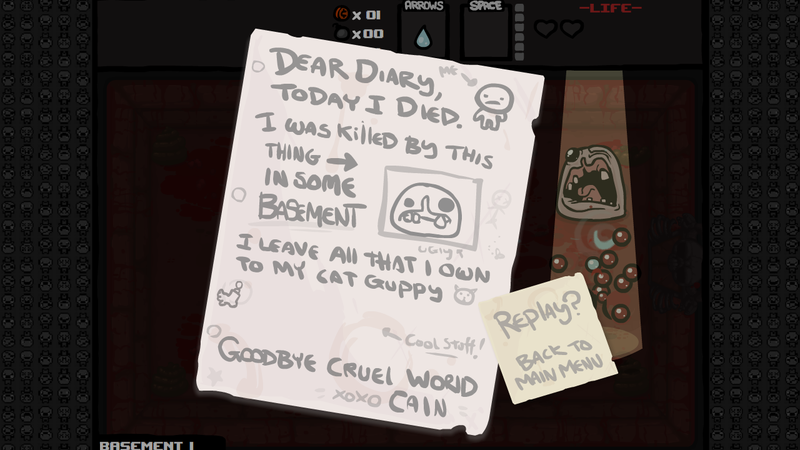 So, I finally got around to playing The Binding of Isaac, and I have to say, I’m madly in love. It’s core mechanics are perfect for what the game sets out to accomplish, and those who have the patience to master it’s mechanics will have plenty of hours worth of entertainment and joy to behold.